Have you ever heard of a muscle called the soleus? Unless you’re a doctor or a runner, you most likely haven’t. The soleus is a muscle in the superficial posterior compartment of the lower leg. It lies just below the gastrocnemius (calf muscle). 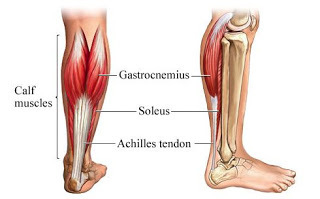 The tendon of the soleus muscle joins that of the gastrocnemius to form the Achilles tendon. The soleus aids the gastrocnemius in plantarflexion, or pointing the toe. These two muscles work together to allow for walking, running and dancing. 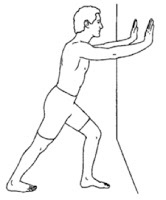 The soleus is vital for maintaining upright posture. If not for its constant pull, the body would fall forward. Another important role of the soleus is to pump the venous blood from the periphery back to the heart when in an upright posture. Due to the bony attachments of the soleus, it is the main muscle for plantarflexion when the knee is bent. The gastrocnemius originates from the femur (thigh bone), so a bent knee limits the effective tension of the muscle, leaving the soleus to do all the work. When performing tasks such as walking, the soleus is primarily used because it is made mostly of slow twitch muscle fibers which allow for better endurance. The most common injury to the soleus is a strain to the muscle. A strain is micro-tearing of the muscle fibers caused by trauma. Strains to this muscle, or either calf muscle for that matter, can be caused by a direct blow to the muscle or overstretching the muscle during activities like sports where there is frequent jumping or changing of direction. These injuries usually occur when the muscles are already tight due to a lack of stretching. Stretching the soleus is super easy. Just make sure to warm up before you start. If you stretch a “cold” muscle, it can increase the risk of injury. Since there are two muscles in the calf, there are two different positions to stretch it…one for each muscle. Almost everyone knows how to stretch the gastrocnemius. The picture on the left shows the knee straightened out…that stretches the gastrocnemius. The picture on the right shows the knee bent…that stretches the soleus. It is extremely important to stretch both muscles to avoid injury and maintain proper function. There are several different ways to treat a strain. Icing the lower leg may help relieve pain and swelling within the first 48 hours. The ice will help reduce any inflammation created by the muscle fibers tearing. After 48 hours, applying moist heat to the lower leg will help warm up the muscle and increase blood flow to the area which facilitates healing. Performing self myofascial release using a foam roller or a tennis ball can help work out any trigger points, fascial points or muscle knots that may develop as the micro-tears heal. Applying kinesiology tape to the affected area can also help with pain relief and healing. The tape can help decompress the tissue and if applied correctly, can help reduce swelling. If you experiencing excessive swelling, cruising or alteration of gait, make sure to seek the help of a medical professional. At Pro Chiropractic, we specialize in sports injuries and are well trained and well equipped to help with soleus strains.